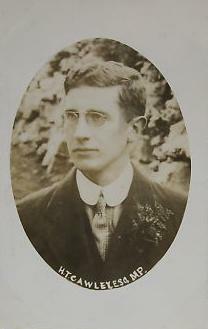 Postcard of Howard Thomas Cawley to celebrate his 1910 election (via wikipedia). In a sad, but not uncommon, example of the toll which the First World War took on many British families, the long-serving Liberal MP for Prestwich, Sir Frederick Cawley (1850-1937), lost three of his four sons during the conflict. What was unique was that, like their father, two of them were Liberal MPs. On 23 September 1915, his second son, Captain Harold Thomas Cawley, MP for Heywood since January 1910, was killed in action at Gallipoli. Harold’s younger brother, Major John Stephen Cawley (1879-1914), a career soldier, had been killed in September 1914 while serving with the British Expeditionary Force in France. His youngest brother, Oswald (1882-1918), who followed their father as MP for Prestwich, also died in France, in August 1918. Harold Cawley’s father was the head of a Lancashire firm of bleachers, dyers and calico printers, but Harold did not follow this occupation. Instead, after being educated at Rugby and at New College, Oxford, he trained as a barrister. He was called to the bar in 1902 and practised on the Northern circuit. In 1909 he was adopted as Liberal candidate for the Heywood division of Lancashire, and won this seat with comfortable majorities at both of the 1910 general elections. Seen as ‘one of the most promising of the younger Liberal members’, he was appointed as parliamentary private secretary to Walter Runciman, President of the Board of Education, in 1910, and then to Reginald McKenna, the Home Secretary, in 1911. Initially ‘reserved’ in the Commons, Cawley was described by the Fortnightly Review as ‘a young politician of the serious type who spoke rarely, and as though speaking were rather a toilsome effort’. However, his fellow Liberal Charles Masterman revealed another side to Cawley’s character: ‘short-sighted and with an arm permanently damaged from a fall, he was always a furious rider. There was nothing he would not risk on a horse, in a hunt or a race’. Masterman lamented that Cawley never came into his own in Parliament, ‘nor had time to reveal his real gifts of intellect and character before he died’. His obituary in The Times recorded that ‘his style was restrained and cultivated, and he was personally much liked’. Having served as an officer in the 6th battalion of the Manchester regiment – part of the territorial forces – since 1903, Cawley volunteered for active service on the outbreak of war. Serving with the rank of captain, he was appointed as aide de camp to Major General Sir William Douglas, who commanded the East Lancashire Division. He went to Egypt in August 1914 and to the Dardanelles in May 1915. He was keen to go to the front lines, noting that ‘I have always felt rather a brute skulking behind in comparative safety while my friends were being killed’. He left Division Headquarters to rejoin his battalion at the front at Gallipoli early in September 1915, and was killed a fortnight later. Praised for his ‘coolness and bravery’ under fire, he is buried in the Lancashire Landing Cemetery at Gallipoli. He has a third-rate brain, no capacity to grasp the lie of the land, and no originality or ingenuity … He has been in the trenches three times since he landed, hurried visits on which he saw next to nothing … He is always thinking of himself, his food, his promotion, his health. His son’s experiences undoubtedly remained at the forefront of Sir Frederick Cawley’s mind when he served in 1916 on the Dardanelles Commission which inquired into the conduct of the campaign. A transcript of Cawley’s uncensored letter is held by the Liddell Hart Military Archives, King’s College, London. This entry was posted in 20th century history, military history, social history, World War I MPs and tagged Gallipoli, Liberal Party History, MPs in World War I, Parliament, Sir William Douglas. Bookmark the permalink.